Good priced decorations for the guest room. Competently executed, they offer an off beat, yet familiar theme. Not spectacular, but they won't embarrass you. Yep, they work. These are cheaply made but cute prints. They serve their purpose. Nice for the price ! Cute vintage looking wall art for a spare bedroom. Absolutely beautiful and gorgeous colors! Am so glad I purchased this as it lightened up the room and goes with many colors. 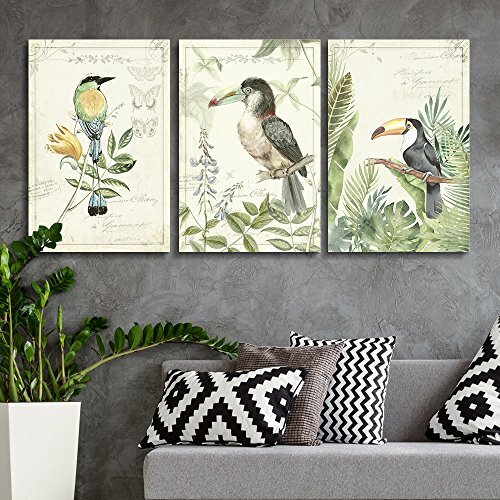 You can't go wrong with their canvas wall arts and a lot of what this company has goes well with the selections they offer. Ordered their bird facing opposite of the one in this set and it matched so well. of three and bought this bird to change it up so two birds would face each other. Definitely going to purchase a few more.